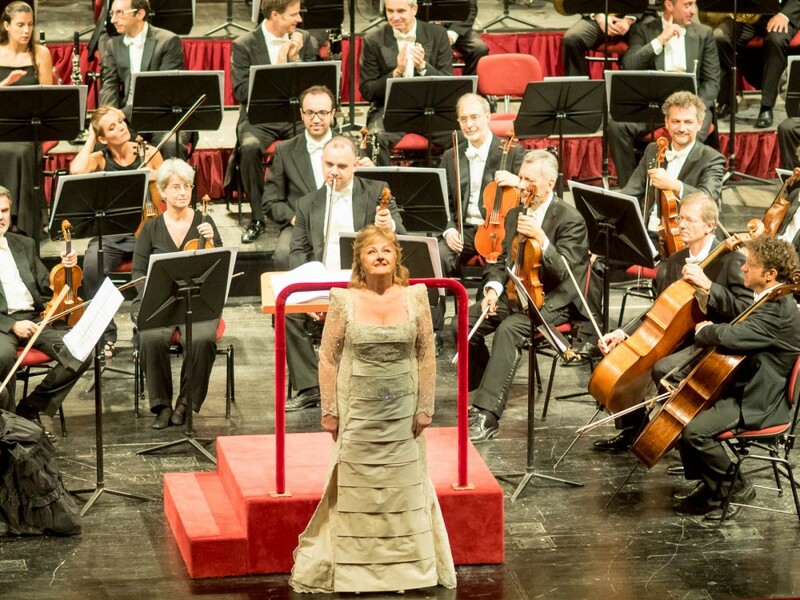 You shouldn’t reveal a lady’s age, they say, but how can I not say that Edita Gruberova is 68 years-old when she took on the final scenes from three of Donizetti’s most demanding operas in one evening. I’m sure that somebody, somewhere, has done this before, but at La Scala with full orchestra and chorus, soloists and offstage band, this was certainly a first. To do so at an age when most singers have long since entered retirement is astonishing. She interpreted (and I use the word deliberately) three queens: Queen Elizabeth I (Roberto Devereux), Anne Boleyn (Anna Bolena) and Mary Stuart (Maria Stuarda) and did so with the regalness and forcefulness of a true opera diva. This is probably why, though there were only three queens onstage, in the auditorium there were many, many, more. People had travelled from far to witness this extraordinary event, and an Event is what it was. Long applause, accompanied by cheering, greeted her first entrance (with dress number one: off-white with horizontal strips like an accordion down the front), the sort of applause, both in length and volume, which you usually hear at the end of a successful performance. The Maria Stuarda overture had preceded her entrance, conducted by an animated and energised Marco Armiliato who I don’t know personally, but must be a thoroughly nice chap! Smiley and human, not one of those growlers. The opera proper started with Maria’s scene and duet with Talbot, La Perfida. Bass Giovanni Furlanetto who has an easy, rich tone sang Talbot; the excellent students from La Scala’s Academy took the other roles. After the interval, came Anna Bolena starting with the chorus asking Chi può vederla? (dress number two: silver sequined number with slim-effect lateral draping and train). After the death of Boleyn there is only the overture from Roberto Devereux to allow Gruberova to change (third dress: Kingfisher blue with flamenco pleating, masses of swirling rhinestones and matching earrings) before launching into the final part of the opera, staggering around the stage and gripping onto the conductor’s podium during the old queen’s mad scene. She was convincing and theatrical without ever losing credibility. A masterful performance. So much applause followed that she gave an encore, which had orchestra and chorus flipping wildly through their scores. The last five minutes or so of Devereux, from Quel sangue versato, was even better the second time around. 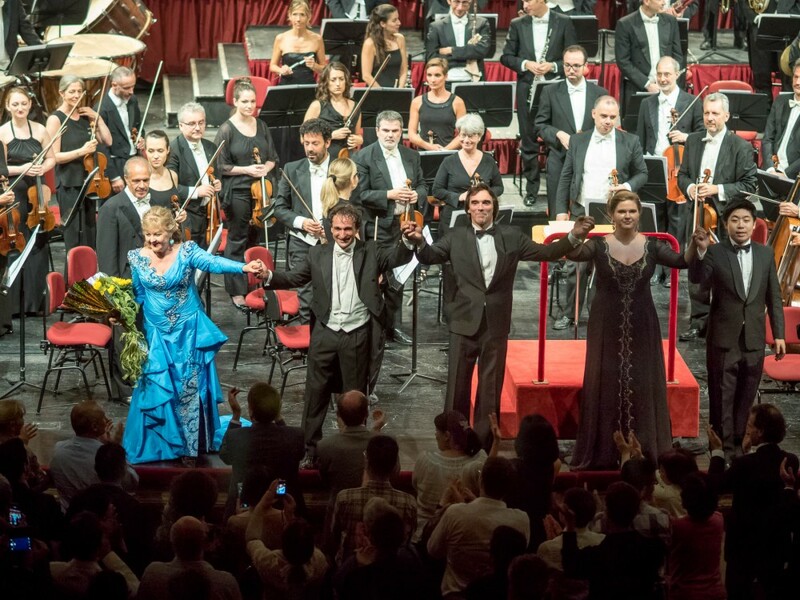 Gruberova did not intend to sing such an ambitious programme, but it was La Scala’s director, Alexander Pereira, who begged her to be part of the Expo line-up. He proposed the idea in my dressing room after a concert. I said no, because I finished the season on 15 July and for me holidays are sacrosanct. However, he went down on one knee, I don’t know whether he was series or just joking, but how could I say no. In front of an important man on his knees, only a real queen could refuse. He wasn’t joking; I have seen Pereira on his knees in front of Mirella Freni and Fiorenza Cossotto. He truly admires these great artists. This piece has talked about dresses and stage presence, because in this context it would be pointless to analyse vocal defects. Yes, sometimes she sounds as though she‘s squeezing her high notes out like toothpaste from a tube; yes, it occasionally seems as though the cello’s stuck his spike in her foot; yes, her intonation is sometimes off (though she corrects it swiftly); and yes, she sometimes growls like an injured lion from her lower register. All this has been present in her voice for years, and the miracle of Edita Gruberova is that she can offer so much more to compensate. 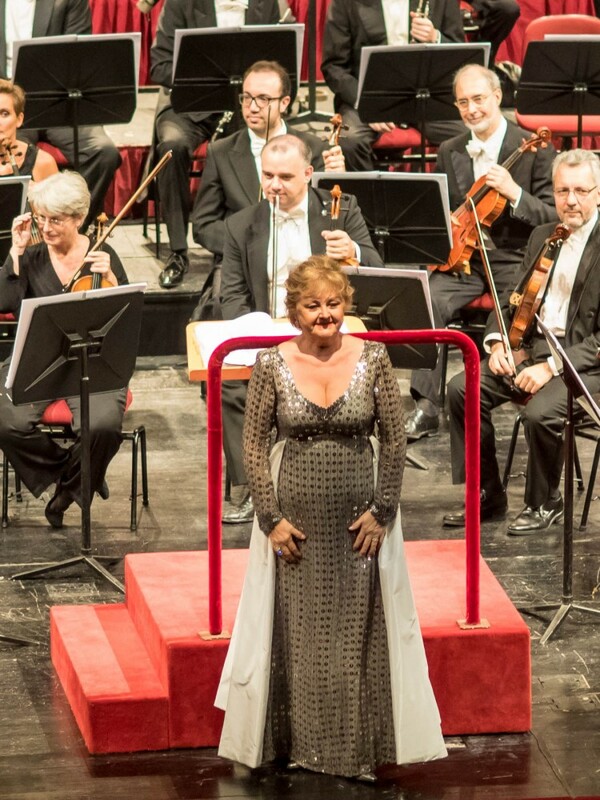 Just her encore, after such a demanding programme, demonstrated her generosity, strength and passion, for which the two-thousand people at La Scala were very grateful indeed as well as the orchestra and chorus who applauded her enthusiastically. Forty minutes after the end of the programme, with the stage lights turned off and techies striking the chairs, she came back on stage to greet fans on their feet, still applauding: the Japanese woman in traditional dress, a tall Austrian couple well over seventy, two teenage Italian boys. A universal appeal. 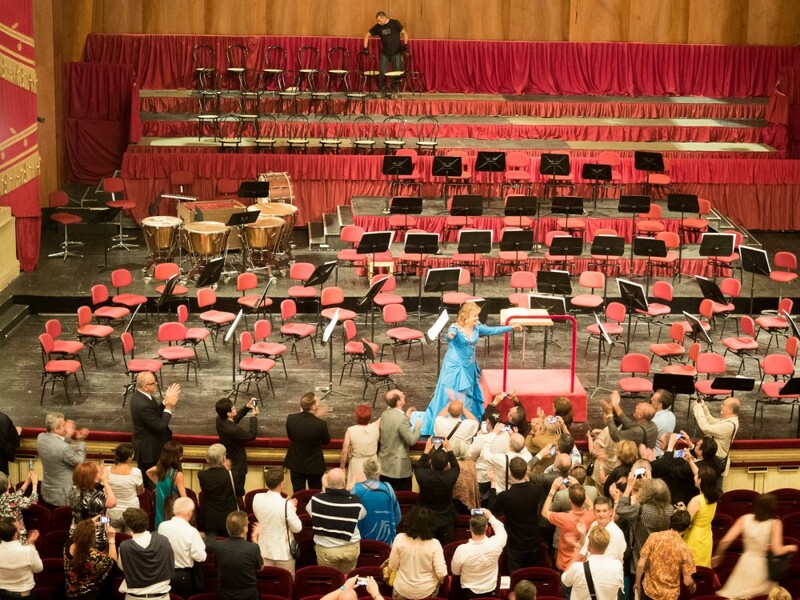 At ten-to-eleven she left La Scala’s stage… probably for the last time. Truly, Edita Gruberova is the best Bel Canto artist in the world! I so want to let her know how much I admire her great humility, God given talent and more so, her generosity to her fans. Recently, I was able to acquire her opera DVD’s, several of her cd’s and a photo of her with her autograph. All are great treasures to me. What a beautiful person and life! Words cannot express my gratitude.